The Institution of Engineering and Technology (IET) have over 168,000 members and have been a Textlocal customer for over 4 years. The IET specialises in supporting those within the industry through events, a diverse resource library and discussion groups. Last year alone, The IET sent 60,000 SMS to support their membership outreach, using the channel to remind members when their renewal was due and request any missing information to speed up the registration process. 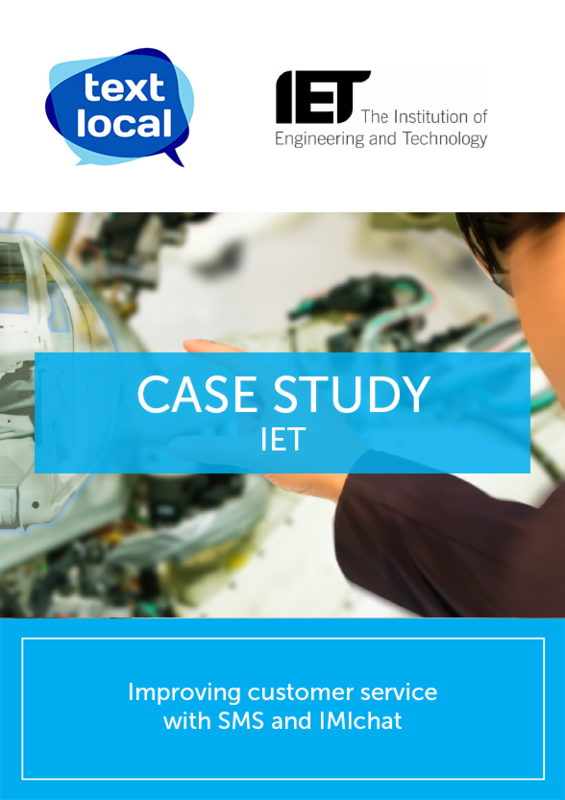 More recently the team at The IET were looking to expand their use of SMS and adopt a more multichannel approach. The IET wanted to support recruitment outreach and improve their membership renewal rates as well as engage in real-time with their existing members across additional channels, including social media. IMIchat from Textlocal enables businesses like The IET to easily interact with their customers across all digital and mobile messaging channels. Staff are able to conduct two-way conversations through the online platform across SMS, social media, email and other messaging channels in a single window. Designed with flexibility in mind IMIchat is web-based for easy access as a standalone application but can also be integrated into an existing contact system. IMIchat was the ideal solution for the IET as it encompassed their already successful use of SMS with additional channels, enabling staff to engage with enquiries from social and more direct channels in real-time. IMIchat has benefitted The IET with an improved rate of membership renewal and retention through the multi-channel approach. Additionally, the IET was able to create two-way conversations with members who had recently been less engaged with their services, gaining valuable feedback to improve existing service delivery. The IET also found that when sending out a bulk SMS renewal notification, their call rate would increase significantly with members looking to make a payment, having a direct impact on the renewal rate. The additional channels also made it far simpler to request missing membership application information, speeding up the completion process. The team commented that the IMIchat and Textlocal platforms work really well together, sending bulk SMS campaigns and managing responses from multiple channels in one platform is more streamlined for all teams. The system is incredibly user-friendly and the ability to communicate with our members in real-time is invaluable. We’ve found that IMIchat makes it much easier for staff and members alike to communicate. Our account manager, Nic is also always on hand with support no matter how many calls we put through to him, he’s always incredibly helpful.